Marspedia is an official project of The Mars Society and The Mars Foundation, with help from The Moon Society. Content on Marspedia is Public Domain unless otherwise noted. Articles that have specific content licenses will be tagged as such. 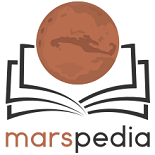 Disclaimer: The content licenses used on Marspedia do not apply to other wikis in our Interwiki network. Mar 5, 2019 - The New Category Hierarchy and our custom Category Selection Tool (part of the MediaWiki Visual Editor) have now been rolled out to Marspedia. Sep 15, 2018 - James Burk and Frank Crossman present the last year's progress on Marspedia at the 21st Annual Mars Society Convention. May 7, 2018 - Marspedia Editorial Subcommittee finishes work on a new Category hierarchy covering Human exploration & settlement topics. Dec 31, 2017 - The Moon Society recounts the recent history of Marspedia in latest Moon Miners' Manifesto newsletter. Dec 31, 2017 - Mars Foundation mentions Marspedia in its End of Year Newsletter. Nov 17, 2017 - The Mars Society officially announces its involvement in Marspedia and calls for volunteers to help. Oct 20, 2017 - Marspedia Governing Council is formed to manage & improve the wiki. This page was last edited on 5 March 2019, at 01:01.